The CrazyCall Cydia tweak has similarities to iVoiceChanger, which allows you to change the pitch of your voice on the iPhone. But CrazyCall also allows you to change your caller ID (SPOOF). 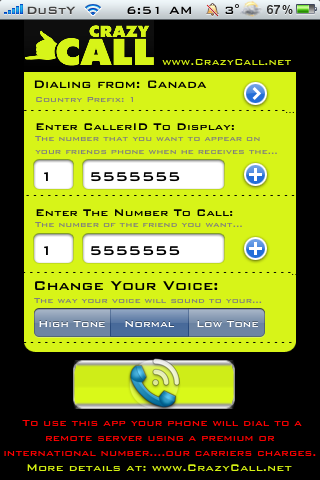 It’s the ultimate application for making prank calls or fooling your friends and family! It’s compatible with the iOS 4 to iOS 9 firmwares and from the iPhone 3G to iPhone 6 Plus. Step 1. Select a Country your dialling from (an example would be… Canada, Denmark, Brazil, France, Germany, etc). Step 2. Enter the Caller ID to display (this number will appear on your friends phone when he receives the call). Step 3. Enter the number or select from your contact list who you want to call. Step 4. Change your voice from 3 tones (High Tone, Normal, Low Tone). Step 5. Now call the number. 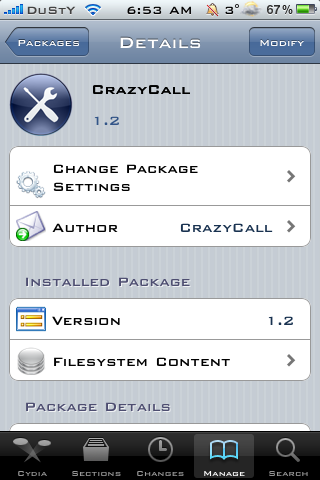 CrazyCall is a free jailbreak tweak, and it’s available right now on Cydia from the BigBoss repository. Leave your thoughts about the tweak down below in the comments, and also, be sure to let us know if this worked to prank your friends, family etc. this app doesnt exist on cydia.. It might have been pulled. Try refreshing sources again and let me know. What would the country be if your in America? so does this waste your minutes? Work’s… the app is free but the call cost’s a lot!!!!! !